“I want to discuss something with you, but I need you to remain calm while I tell you,” my friend Traci caught me as I was entering my dorm room. Wondering what was coming next I waited. 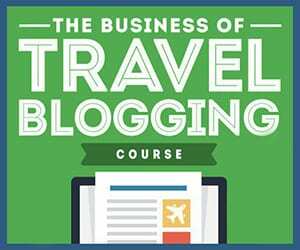 “I’m planning a trip to the Wizarding World of Harry Potter in Orlando and the hotel will be cheaper if we split it between 4 of us. I need one more person.” Remain calm?? Who was she kidding? 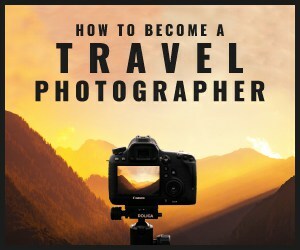 YES YES YES I WANT TO GO! When do we leave?!?! If you don’t already know, I’m a HUGE Harry Potter fan, so there was possibly nothing more thrilling than the idea of being able to step into the world I loved so much- and this time not just in my head. I didn’t know exactly what to expect, but I had hopes it would be fairly accurate to the books. Unfortunately it was neither accurate to the books or the films, but still an enjoyable experience, if you, like me, enjoy anything Potter. We went in October so that we could experience the Universal Halloween Horror Nights the first evening we arrived in Orlando. This is a story for another time, but let’s just say I learned that I have neither the fight or flight reaction when I get creeped. I just freeze. So if I should ever meet a Dementor or a giant spider… things wouldn’t end well for me. Despite October being a sort of off season time, there were still enough visitors to the Harry Potter part of the Universal park that we had to strategize our mornings. Each morning we rose early, skipped breakfast, and quick marched to the park. We stayed at a hotel just outside the entrance to the park. 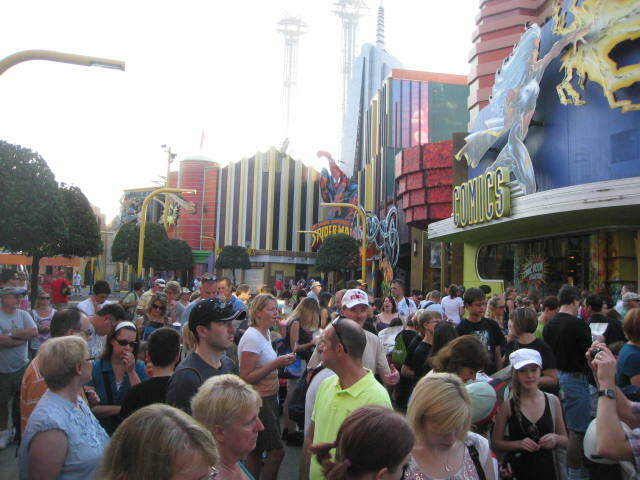 It was only a short walk down a tree lined path to the Universal Boardwalk. Once inside the entrance we were able to walk half way through the park before coming to a bottleneck where a park guard held the restless crowd until the second the park actually opened. Park goers seemed to push and shove to get to the front of the crowd while the guard watched the seconds on her watch tick by. When she lowered her arms the crowd surged forward at a run. The three of us sprinted after Traci. Crowd waiting until the park officially opened. We arrived at the Harry Potter area, entering under an arch with a Hogsmeade sign. Traci kept sprinting so my first impression was of a street about a block long lined with small shops from the Harry Potter world and culminating at the Hogwarts Castle. The roofs of the shops held fake snow and we sprinted past a giant snowman and a cart selling Butterbeer in the middle of the street. The whole place was smaller than I expected. The reason for rising early, skipping breakfast, and sprinting to the castle quickly became apparent from the sign outside alerting guests to how long they would be waiting in line to enter the castle ride. Being one of the first there, we were able to zip through the castle interior, take the ride, and still have the rest of our day to leisurely visit both Universal parks. By the time we exited, the line was about 3 hours long. 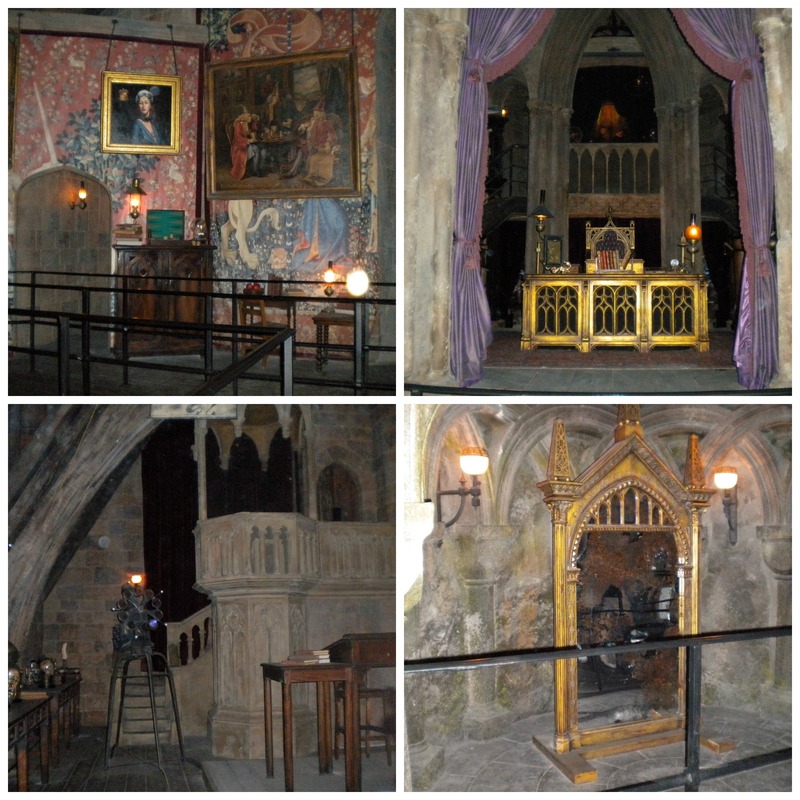 The entire castle interior is built around the ride line to provide entertainment during the wait. The line snakes back and forth through replica Hogwarts rooms, past replica film props, and projections of characters that talk to you. 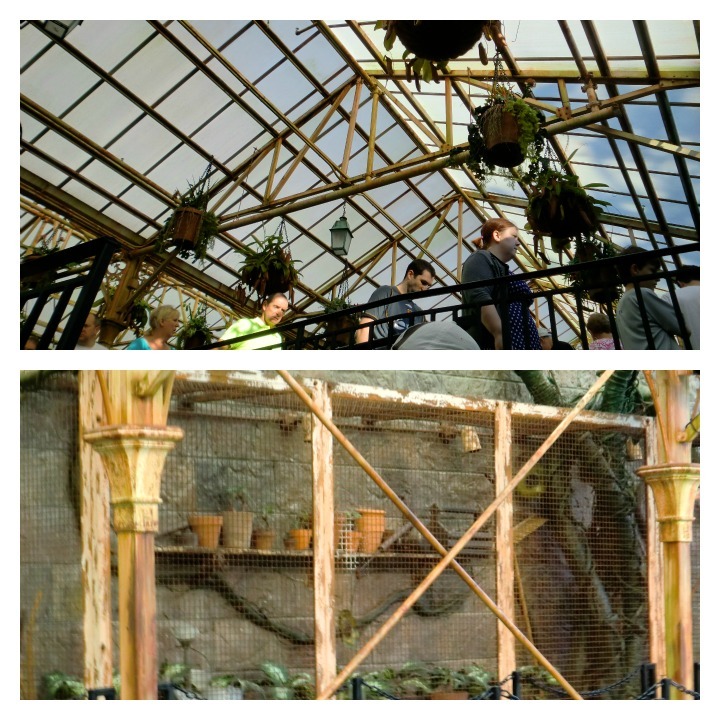 You start in one of the Herbology greenhouses and proceed through various classrooms, the Gryffindor common room, and the Headmaster’s office. Eventually you come to the ride. Instead of a front facing roller coaster car, we were all strapped in side by side facing out. The car took off and before we knew it we were tilting forward as if flying on brooms behind Harry, Ron and Hermione, flying over the Hogwarts grounds. Then suddenly there were Dementors blowing cold air our faces, and then giant spiders sprayed us with cold water. I was gripping my seat so hard. When we exited I told Traci she would NEVER get me on that ride again… However, by the end of the day it was all an exciting memory and I was ready to go again the next morning. We spent the rest of the morning exploring the rest of the so-called “Hogsmeade” which actually contained shops from both Hogsmeade and Diagon Alley. As we strolled the street we noticed the majority of the other tourists around us were speaking with British accents. Do British children have a school break in October? Anyway, it made the whole experience feel slightly more accurate. 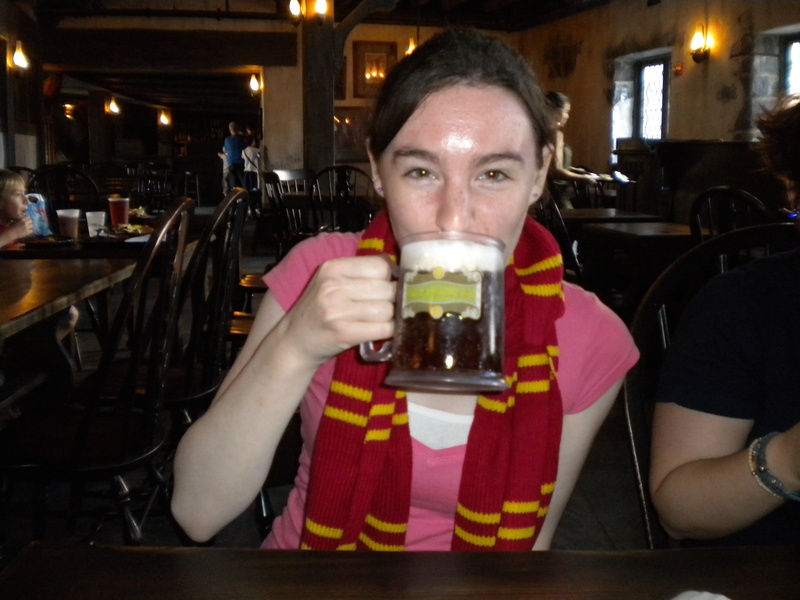 We stopped for a meal and our first of three mugs of Butterbeer at The Three Broomsticks. In retrospect, it was two too many mugs. The foam has the consistency of rubber. It bounces back when you poke it! 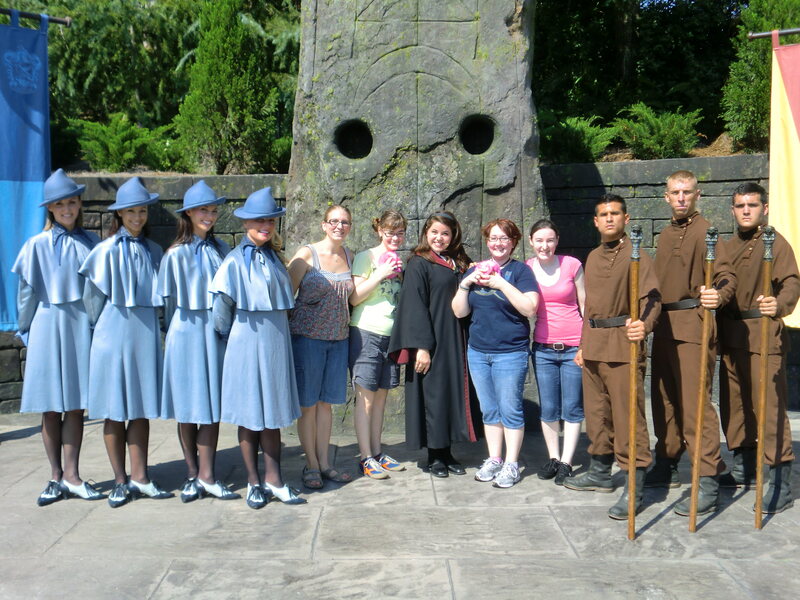 After lunch we stopped for a bathroom break before we continued our exploration of Hogsmeade. While I was washing my hands I heard through the din of the crowded bathroom a muffled wailing and moaning. 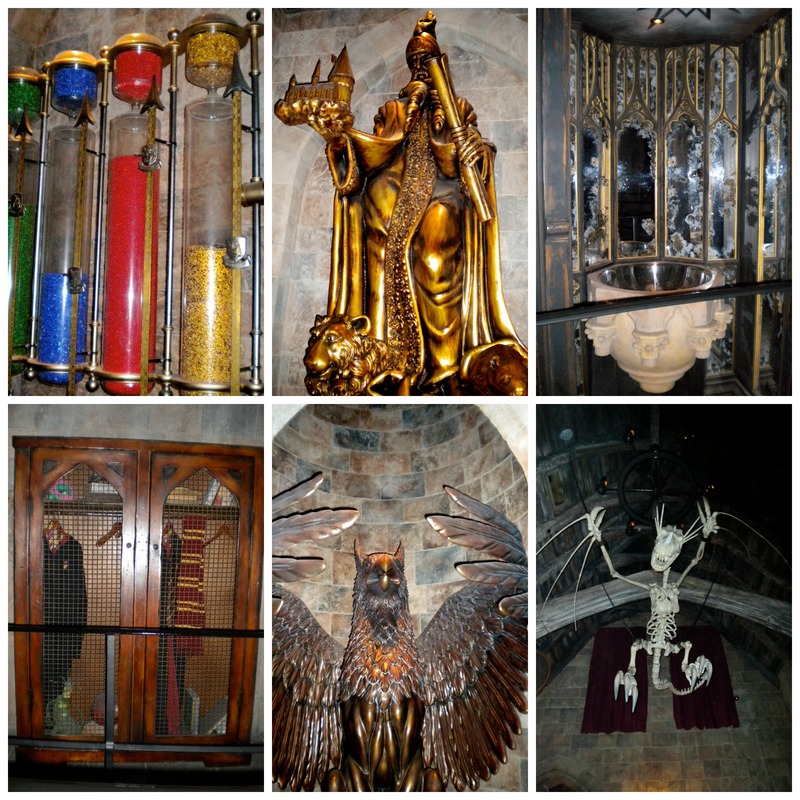 I grinned at Traci, recognizing the distinct sounds of Moaning Myrtle being piped into the ladies room. Finally, it was time to shop! 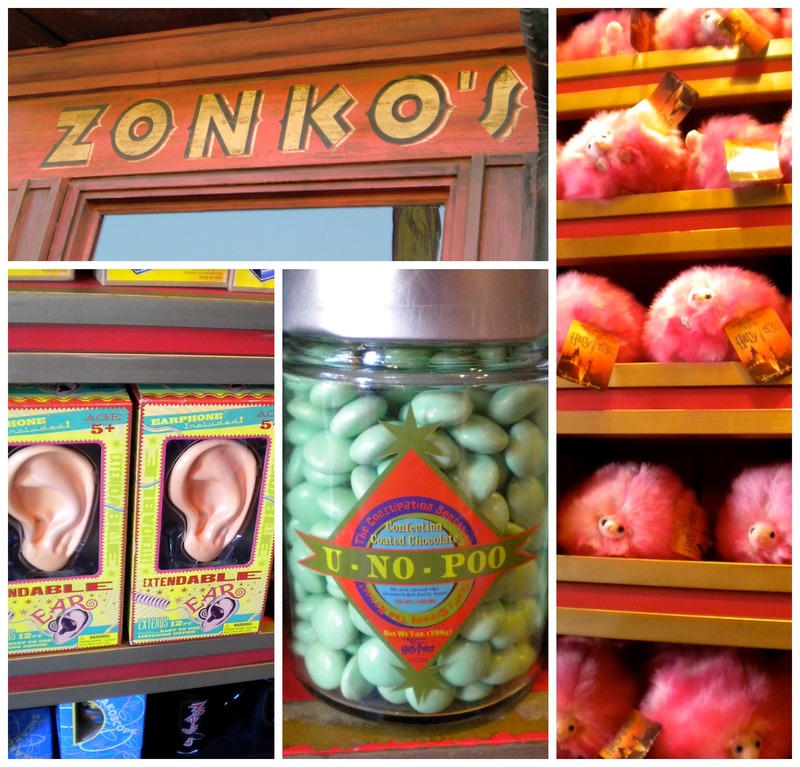 Zonko’s Joke Shop and Honeydukes Sweet Shop shared a space. 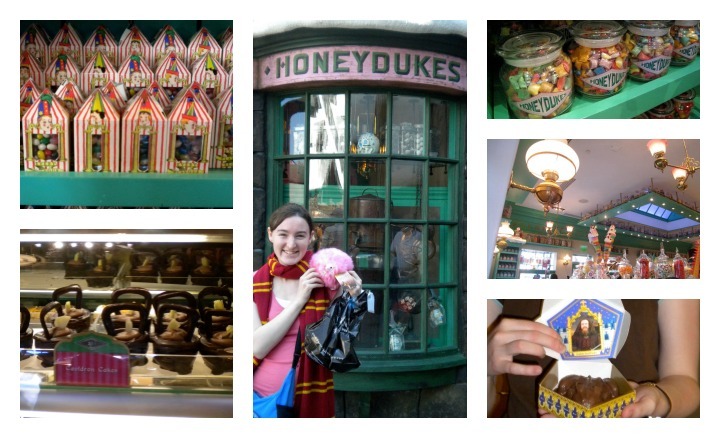 The sweet shop had Bertie Bott’s Every Flavor Jelly Beans, Chocolate Frogs, Cauldron Cakes, and many other brightly colored sweets. I bought a chocolate frog. When I opened it that evening to share with the girls, it luckily did not attempt to hop away, but we discovered that it isn’t even hollow. It’s a solid block of chocolate that no plastic knife can penetrate. You can barely even break it with your teeth. Oh well. At least it came with a collectible wizard card! The line to get into Olivander’s Wand shop was also 3 hours long, so we skipped this shop each day in favor of the ride. If you want to get in there, your best bet is line up as soon as the park opens. If you skip Olivander’s, you can buy a wand at the Postal shop. You’ll just miss out on the performance where Olivander chooses a wand for you. The Post Shop, which sells all manner of journals, stationery, and postcards also offers to stamp your postcards with a Hogsmeade stamp. While I had bought all sorts of things so far, the only thing I had meant to buy during this trip was a Gryffindor scarf. The line to get into the Quidditch clothing, other apparel and trinkets shop was thankfully shorter than the wait for Olivander’s. 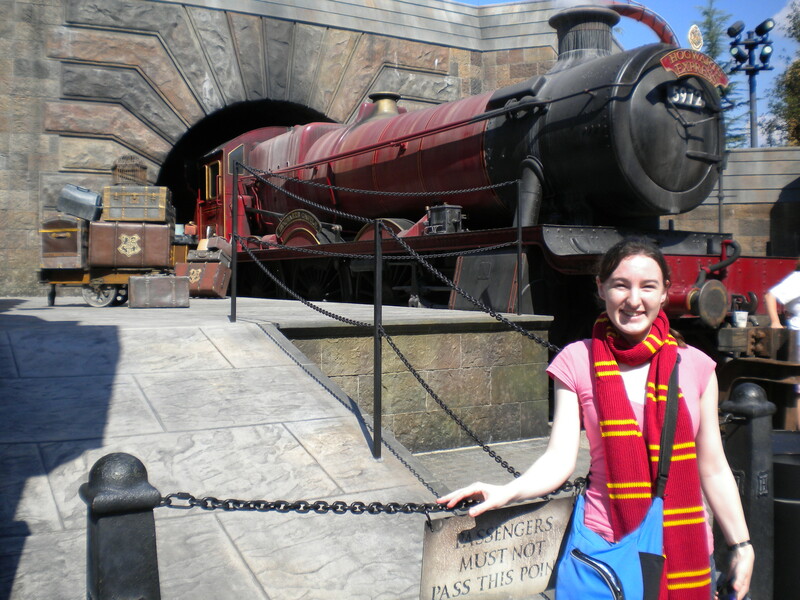 I tried on robes, looked at Remembralls, Quidditch balls, and eventually found the scarf I had come for. I was all ready to head off on the Hogwarts Express! Unfortunately we visited before the newer Diagon Alley and Hogwarts Express part of the park was built. I can’t wait to return and explore the new addition! 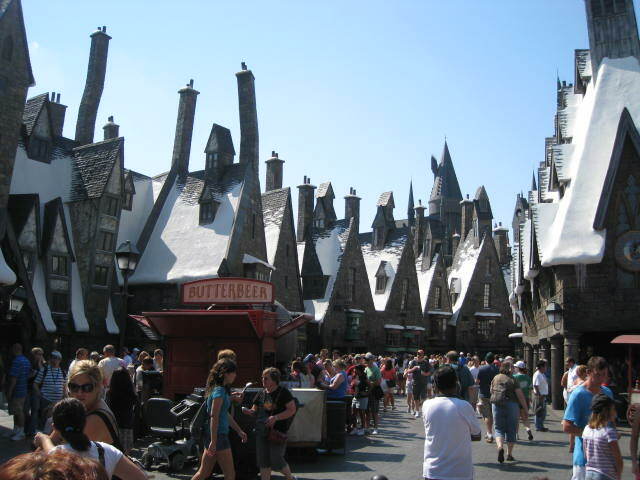 Have you visited the Wizarding World of Harry Potter in Orlando? If you could step into the world of your favorite book, where would you go? Tell me about it in the comments below!